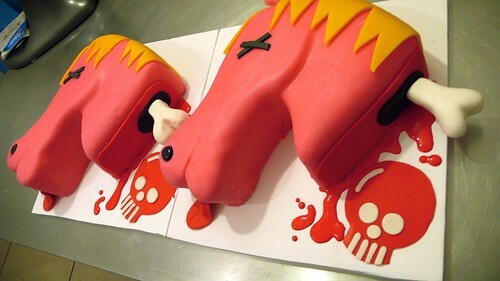 Dead Horse Heads Cakes, a photo by CAKE Amsterdam - Cakes by ZOBOT on Flickr. Cartoon versions of the dead horse heads from the Godfather made for HOBBY FILM, a Swedish Production Agency setting up offices in Amsterdam in 2012. As the new kids on the block, they introduced themselves to Amsterdam and future clients, business associates with this gift of cake... DEAD HORSE HEAD cakes! You best pay attention or else you'll be swimmin' with the fishes! Cause HOBBY FILM is comin' to town!